Soon you and a group of friends can experience Ezio's acrobatics as represented by tabletop dice rolls. Videogames may get the lion's share of media attention these days, but it's worth noting that the board game industry is expanding as well. In fact, many popular videogame franchises have been adapted to tabletop format, including Civilization, Gears of War, and even Arkham City. There's clearly a market for non-electronic versions of these games, so Ubisoft is producing its own contribution with Assassin's Creed: The Board Game. It may be hard to imagine how an acrobatics-focused title can adapt to miniatures and dice rolls, but we'll find out when it arrives this winter, coincidentally the same launch window for Assassin's Creed 4. Details on Assassin's Creed: The Board Game are light, but we do know it will be set in Assassin's Creed II-era Constantinople. Each player must complete various assassination contracts across the city, all while avoiding guards, gathering treasure, and generally tripping up fellow opponents. 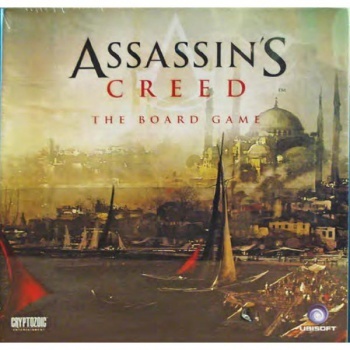 Assassin's Creed: The Board Game is developed by Arkham City Escape creator Cryptozoic with Ubisoft's blessing, although the publisher has yet to make an official announcement for the game. It's hard to say at the moment whether Assassin's Creed: The Board Game will be a robust, engaging product, or just a thrown-together tie-in for Assassin's Creed 4. Still, the concept sounds interesting, and it can't be any stranger than last year's Assassin's Creed city building sim, so it may be worth keeping an eye on as winter approaches.